Home » Posts Tagged "Heavy Rain"
Umbrellas: Where is its presence in gaming? To our American and Canadian cousins, the British Academy of Film and Television Arts (BAFTA) is kind of the British equivalent of Academy of Motion Picture Arts and Sciences (AMPAS), which organises the Academy Awards, otherwise known as The Oscars. BAFTA recognises video games and has done since the late 90s, which not only means that we get to wear tuxedos once a year and attend an opulent awards ceremony, but also that the British games industry gets support and acknowledgment from a highly respected institution. 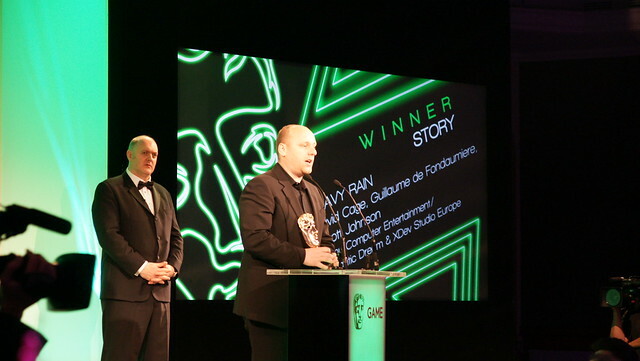 You can read my report from the 2011 ceremony over on PlayStation.Blog.EU, but the summary is that Heavy Rain won the awards for technical innovation, original music and best story, while God of War III collected the gong for artistic achievement. Just as the after party threatened us folk working the next morning with full swing, I had a chat with Heavy Rain’s writer and director David Cage about what these awards mean and what Quantic Dream has planned for the future. What are your initial feelings after collecting three BAFTA awards this evening?